The Coasters may wear the crown when it comes to mixing comedy with rock ‘n’ roll, but they weren’t the first group to include an element of social satire in their recordings. Another West Coast group takes that prize, The Olympics. Collected here are all their singles for the Arvee label plus all their LP only tracks. 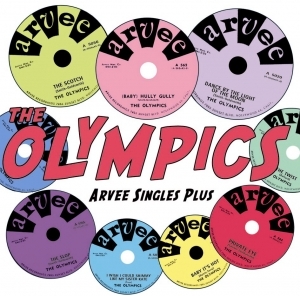 The Olympics didn’t go on to reach the heights or legendary status that The Coasters did, but their recording career lasted over a decade during which time they released, re-recorded and released again a slew of records that are still sought out today by rock ‘n’ roll and soul collectors. Mid way through 1959 the group hooked up with Richard Vaughan’s Arvee label and debuted with “Private Eye” c/w “(Baby) Hully Gully)” but the record was a slow starter. The next release was “Big Boy Pete” c/w “The Slop” and although ”The Slop” had been originally intended as the A side, Dee-jays preferred the group’s remake of Don & Dewey’s “Big Boy Pete” enabling it to have a three month chart life making a very credible # 10 on Billboard’s R & B charts. The group’s next single fared better on Billboard’s pop chart but failed to make any headway in R & B circles. It also gave them an albeit fleeting, appearance on the UK charts. “Shimmy Like Kate” (Arvee 5006/Vogue Pop V 9174) was a re-working of a song from the 1920s and made # 42 in the U.S. and # 40 here. This CD contains two Olympics titles that have not appeared on CD before, “Baby It’s Hot” and “What’d I Say Pt 2” and unlike other reissues has been anthologized by single releases.